The Friends of Doernbecher, a volunteer organization dedicated to the long-term support of OHSU Doernbecher Children’s Hospital, recently awarded four grants totaling $175,000 to support clinical and research projects and programs at OHSU Doernbecher. The following faculty grant recipients were selected from among 21 applicants by Friends of Doernbecher members. Peter Kurre, M.D., received $60,000 to support ongoing research to develop safer methods of bone marrow stem cell gene therapy in children. Stem cell gene transfer could be used to treat children with Fanconi anemia and other blood disorders. Kurre’s research team has developed a new system that dramatically improves researchers’ ability to bring gene therapy into the clinic, and is considered the safest and most efficient method yet developed. 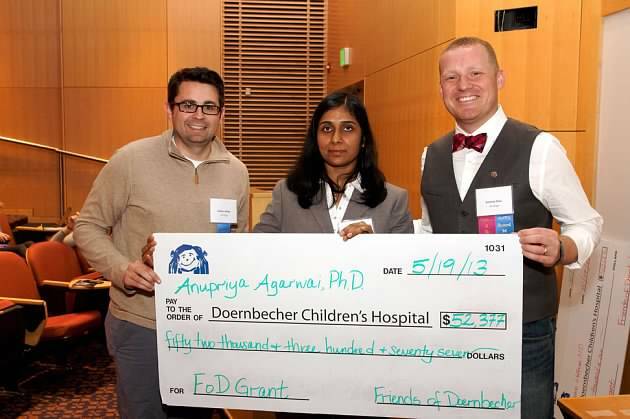 Anupriya Agarwal, Ph.D., received $52,377 toward the development of new therapies for T-cell acute lymphoblastic leukemia (T-ALL), an aggressive blood cancer that makes up 15 percent of childhood leukemia in the United States. 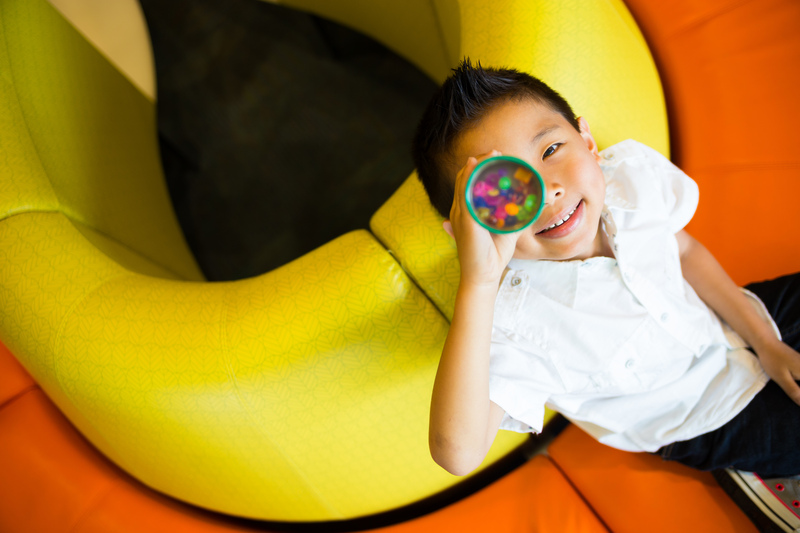 Although great strides have been made toward the treatment of childhood leukemia, the available therapies do not necessarily work for all patients – and those that do work can have devastating side effects. New therapies are needed, and Agarwal’s approach is to find new drug combinations that target cancer-causing proteins. Benjamin Hoffman, M.D., received $43,006 for a program to protect infants from the dangers of motor vehicle crashes, starting with a newborn’s very first car ride. 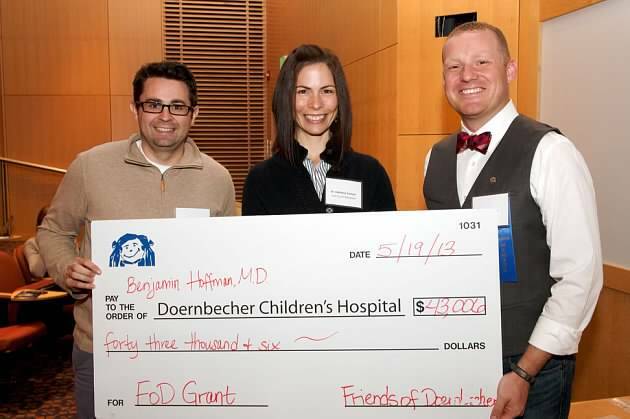 Hoffman will conduct a study to determine how OHSU Doernbecher might offer education, hands-on training, and car safety seat fittings as a part of routine care to newborns and their caregivers prior to discharge from the hospital. Motor vehicle crashes claim the lives of more American children than any other cause, making car safety a vital component of preventive care for children. 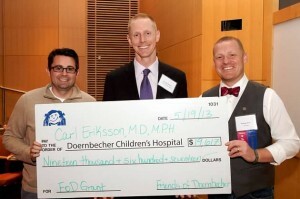 Carl Eriksson, M.D., M.P.H., received $19,617 to develop an emergency preparedness plan for OHSU Doernbecher’s Pediatric Intensive Care Unit (PICU). 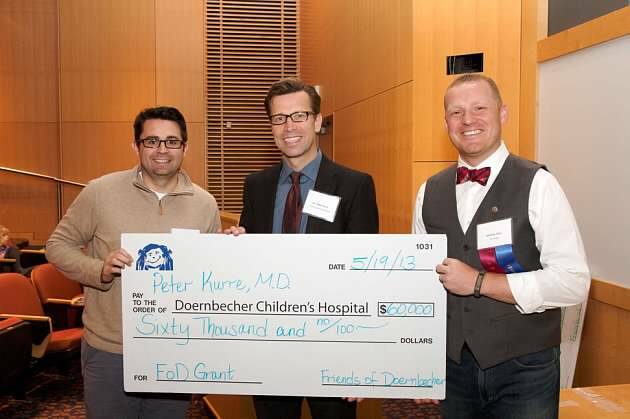 The plan will enable Doernbecher’s PICU to increase its capacity by partnering with Seattle Children’s Hospital PICU in the event of a pediatric public health emergency. 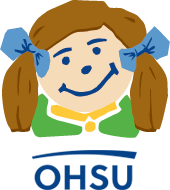 Doernbecher and Randall Children’s Hospital are the only institutions in Oregon with level-1 PICUs and already operate at near capacity. Regional resource sharing, emergency licensing of providers across state lines and other strategies to facilitate interstate mutual aid partnerships would be necessary to accommodate a dramatic increase in critically ill patients during a public health emergency. Friends chapters hold fundraising events in their communities to raise awareness and funds for OHSU Doernbecher Children’s Hospital. We couldn’t be more grateful for their tireless efforts.